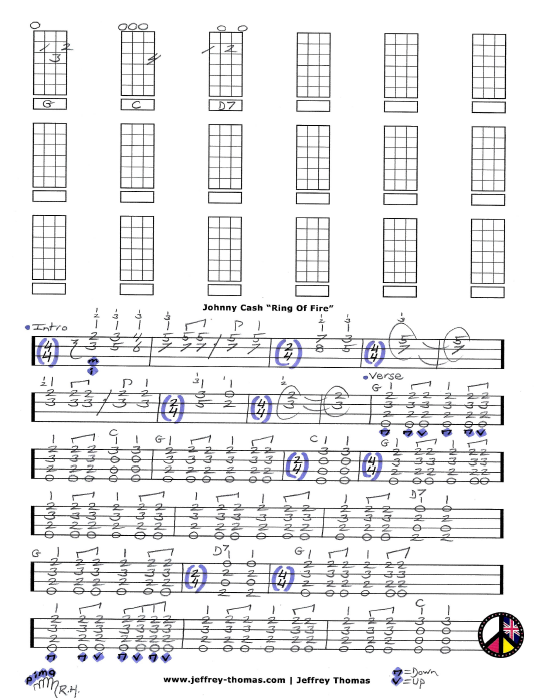 Johnny Cash Ring Of Fire Free Ukulele Tab by Jeffrey Thomas. Learn to play this classic Cash tune in the original key with all the proper licks, chords, strumming, meter changes and song structure. I have the complete song done in a solid vocal accompaniment version ready to go for a sing-along or just playing on your own. Want the full ukulele tab for free? Just send in your email address using the form provided. Looking for the best online ukulele lessons? Fill out the Schedule A Free Lesson form to set up your free Skype ukulele lesson today. “Ring Of Fire” became the biggest hit of Cash’s career holding the number 1 position on country charts for 7 weeks! Find more awesome, free online ukulele tabs on my blog, tab and video pages. Share This Ukulele Tab, Choose Your Platform!